The constellation Serpens Cauda. Roll mouse over to see labels. Serpens is unique among the constellations in that it is divided into two separate pieces which are considered part of the same constellation. It represents a snake which is usually depicted either wrapped around the waist of Ophiuchus the serpent bearer, or else wrapped behind his back. When Eugène Delporte came to define the modern constellation boundaries in the 1920s, he faced the problem of how to separate the serpent and serpent-bearer into two separate constellations, and he opted to split the serpent into two parts. Serpens is an equatorial constellation which appears highest in the evening sky in the months around June. The head of the snake is well separated from the Milky Way, and contains no bright deep sky objects. The tail of the snake, however, not only lies close to the plane of the Milky Way, but also neighbors Sagittarius, the constellation which contains the galaxy's center. It is home to several bright open clusters and globular clusters. 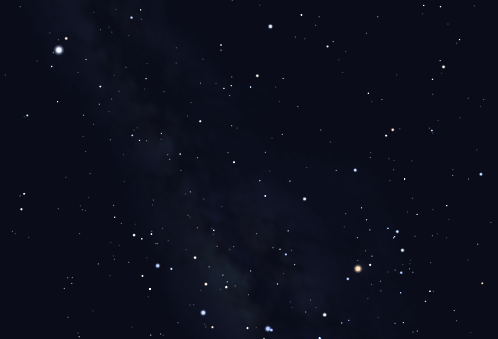 Serpens is not the only snake in the night sky, and neither is it the largest. The largest of all the constellations is Hydra, the water snake, which also has a smaller and fainter companion in the far-southern sky, Hydrus. Serpens Cauda contains the following Messier object: M16. 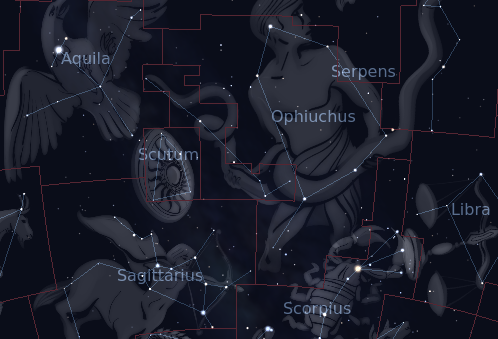 The following constellations neighbor Serpens Cauda: Aquila, Ophiuchus, Sagittarius, Scutum.